Two UK artists staying in Ukraine within a residency program presented their works to the artistic community at the 33 Soshenko Art Studios. Ukrainian artists who had to also assume the role of civic activists to preserve the studios speak about the history of the place and share their future plans. Sarah Tynan and Sarah Lippett are two of the six UK artists who worked in Ukraine in the framework of an artistic residency program. The program entitled SWAP is initiated and run by the British Council. It places Ukrainian artists on residency programs in the UK and vice versa: gives UK artists opportunity to explore Ukraine’s artistic scene and work over their own projects in artistic residencies in Ukraine. On September 24 Sarah Tynan and Sarah Lippett presented their works at the 33 Soshenko Art Studios to the artistic community and spoke about the projects they were following while in residence in Ukraine. 33 Soshenko Art Studios. 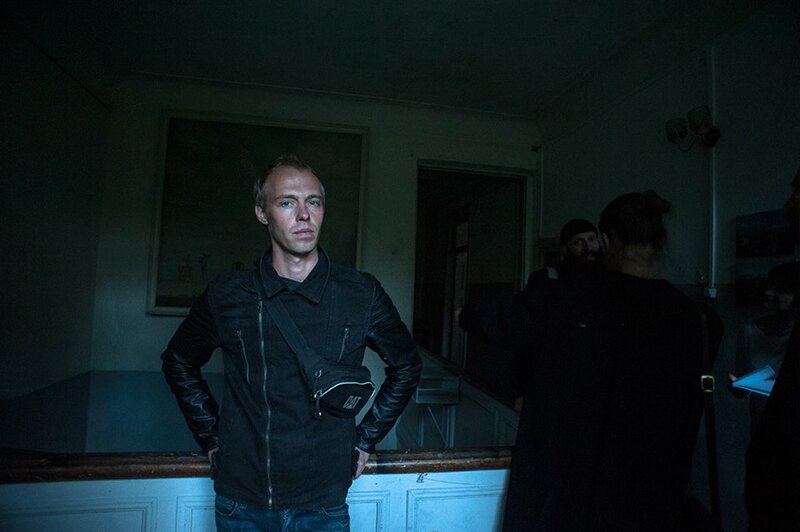 Photo by Anna Sorokovaya. 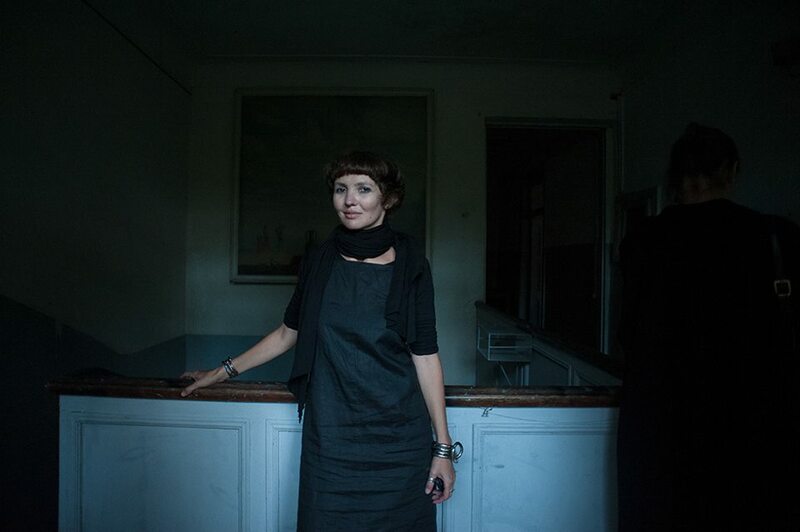 Sarah Tynan, Dublin-born and London-based artist was resident at the 33 Soshenko Art Studios in Kyiv in September 2016. Sarah holds a Master degree in Painting from the Royal College of Art in London. Installation is a technique the artist widely uses to research individual space within a wider urban public context. Tynan’s “Multifaith” work received the Dazed Emerging Artist Award in 2015. The work is a reconstruction of an actual chapel in Austria from which all the religious symbols were removed. Artist Sarah Tynan. Photo by Anna Sorokovaya. In Kyiv Sarah Tynan’s particular interest was with the city’s modernist architecture, some of the examples of which include the “Salute” hotel, the Crematorium and the “Tarilka” concert hall. Sarah expressed the opinion that apart from its direct function the Soviet-style architecture used to have a strong ideological component and affected people mentally. The process of decommunization also captured the artist’s attention. “Although the Soviet system was extremely difficult, I don’t agree with erasing history,” commented the artist. “Destroying artwork is extremely negative,” she continued. “You should not erase that part of the conversation”. The work, that Sarah started while on the residency program in Ukraine, is still work-in-progress. The artist demonstrated an artistic piece of what she hopes will become a big wall. It comes as a curtain split by sections each of which is filled with what reminds of house debris and refers to the idea of demolished buildings that are being covered with fabric. Speaking about her motivation to come to Ukraine Sarah Tynan said: “I was really interested in seeing what it is like living and working in a city which is so close after Maidan and what it means for art making.” The artist said she was impressed with enthusiasm that Ukrainian artists demonstrate despite little governmental support. She noted that they are really anxious to make arts and create the artistic infrastructure. Sarah Lippett is a London-based graphic artist. She graduated from the Royal College of Art. Sarah has produced a number of illustrations for magazines and newspapers including The New York Times, The Guardian and Time Out. She is the author of the graphic novel “Stan and Nan” that tells a touching personal story of relationship between the artist’s grandmother and grandfather whom she never met. 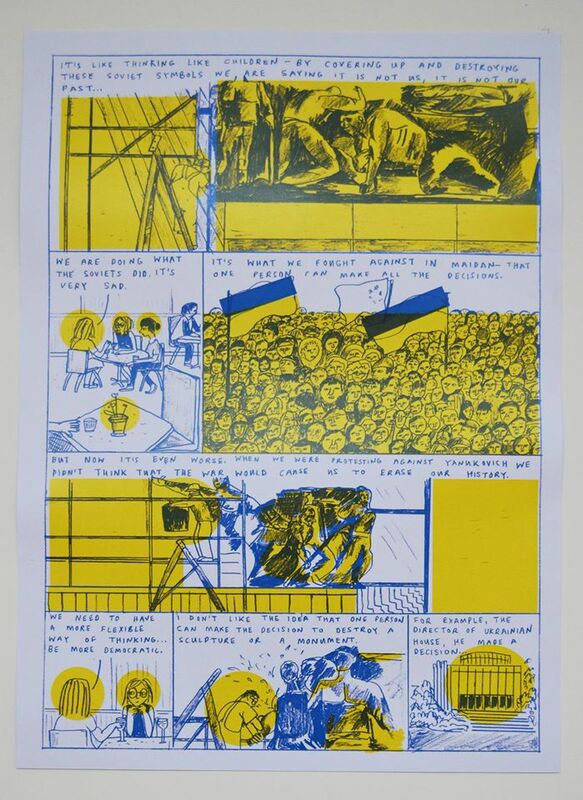 Sarah’s graphic works and comic strips were published as books and make part of public space. 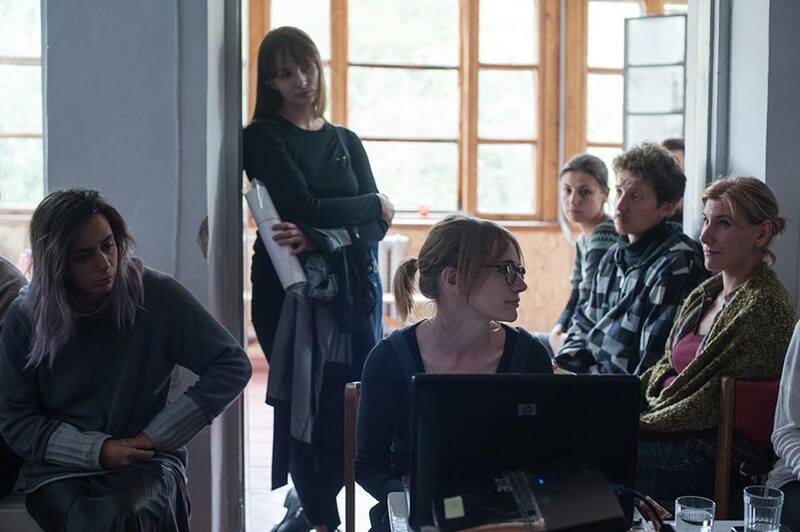 Within the SWAP residency project in Ukraine, Sarah Lippett spent a month at the Muzychi Expanded History Project – a residency space outside Kyiv organized and run by Ukrainian artist Alevtina Kakhidze. Lippett’s Ukrainian work is a series of graphic stories based on conversations with residents of Muzychi and other people as well as on visual documenting. To illustrate her stories the artist uses the colors of the Ukrainian flag. “I was told everyone paints everything blue and yellow after 2014 and I thought it was brilliant,” Sarah explains. Speaking about her Ukrainian experience the artist said she was impressed with the generosity of Ukrainian people. “I also really love the buses you have here – you pass the money [to pay the ticket],” she said. For the presentation of interim results of her residency work in Muzychi Sarah made what she calls her “own Muzychi money” with Alevtina Kakhidze, her husband and a dog that the guests could use and pass to the driver of the special bus that was supposed to take them to the village. Sarah’s Ukrainian works may well transform into a book, the artist noted, that she would be also happy to have translated into Ukrainian. Sarah Lippett’s Ukraine-inspired graphic art piece. Photo: the Muzychi Expanded History Project. Following the presentations of artists Anna Sorokovaya and Taras Kovach, artists and curators of the 33 Soshenko Art Studios, made an excursion along the 33 Soshenko Art Studios. The curators spoke about the residency’s origin, history, their struggle to preserve the space for artists and about their future plans. 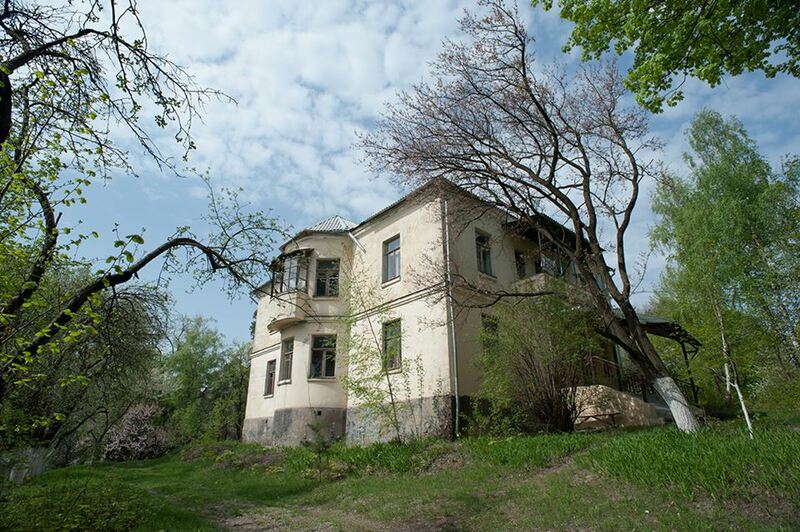 Premises of the 33 Soshenko Art Studios were constructed in 1949 as a private villa but were soon transferred to the Ukrainian branch of the USSR’s Arts Fund while still under construction. The house provided working space to artists – fresh graduates for three years and was sort of an “artistic residency” at that time. In the 60s the studios were re-subordinated to the USSR Academy of Arts, they continued to serve as workshops for fresh graduates. According to Anna Sorokovaya, in the Soviet time the studios used to be the place of free artistic expression, exchange of ideas and non-censorship. The studios’ suburban location and thus less control and pressure exercised upon them made it possible to maintain this unique spirit over the years. “Spirit of freedom was present here even in times when the strictest control was exercised,” said Taras Kovach. “Kyiv was considered to be at the periphery, that’s why control over artists and artistic activities here was not so rigid”, he added. “All who used to work here in their memories mention that it was a place where active and free communication was swirling even in the times when everything around was very strict,” explained Anna Sorokovaya. “Many refer to the place as to the one that formed them as professionals, as artists,” she added. As Ukraine got its independence, the 33 Soshenko Art Studios as well as the land plot around them were transferred into the property of the National Academy of Arts and Architecture in Kyiv. The studios preserved their postgraduate function serving as workshops for artists. Currently there are nine workshops in the studios. In 2012 illegal construction was supposed to start on the land plot where the studios are standing. A 25-storied residential building was the ultimate goal. Artists struggled to preserve the studios by getting to the streets to protest as well as by collecting legal documents to get the heritage status for the studios. Local residents supported the artists. Illegal construction was stopped. In 2014 resulting from efforts of the artistic activist group the premises were granted the status of a cultural heritage site. In 2015 the studios were one of the locations within “The School of Kyiv” – Kyiv Biennial 2015. The studios’ curators envisage their plans to keep developing the studios as workshops for artists as well as the residency place. “We are not only anxious to save the place but to keep developing it as a residency and develop its educational functionality important to the Arts Academy,” Taras Kovach said. Taras Kovach, curator of the 33 Soshenko Art Studios. Photo by Anna Sorokovaya. Cover photo: Sarah Tynan and Sarah Lippett present their Ukraine works at the 33 Soshenko Art Studios. Photo by Anna Sorokovaya. This article was amended on October 21, 2016 to clarify that historically the main function of the 33 Soshenko Art Studios has been postgraduate education. 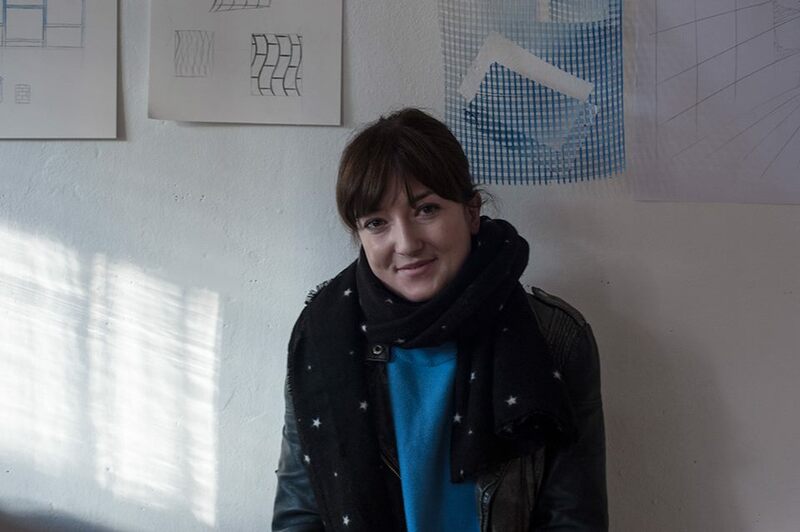 The studios have been providing workshops to artists – recent graduates. The studios’ curators are now trying to expand this role and be also developing the premises as residency. An earlier version also referred to “The School of Kyiv” – Kyiv Biennial 2015 as the Kyiv Contemporary Art Biennial.